Captain Ramsey: God help you if you're wrong. Lt. Commander Hunter: If I'm wrong, then we're at war. God help us all. Tony Scott tends to take his films a bit too seriously for his own good. Movies like Enemy of the State and Man on Fire would improve tremendously if he toned down his direction, opting to embrace the story's entertainment value as opposed to his artistic excesses and ominous storytelling. However, in the midst of a career that can be considered inconsistent at best, Scott dished out a marvelously intelligent, taut thriller in the guise of a submarine war movie. Crimson Tide plays as a wonderful hybrid of Das Boot and The Hunt for Red October, combining the claustrophobic action of one with the intelligence and plot twists of the other. Radical Russian nationalists are on the verge of overthrowing post-Cold War Russia's government during their ongoing struggle with Chechnya. Threatening to launch nuclear attacks at anybody who intervenes, the American military is put on a war footing as all signs point to the outbreak of World War III. Under the command of veteran commander Captain Ramsey (Gene Hackman), the USS Alabama submerges into the Pacific Ocean in order to take out Russian missile silos should the need arise. The tough-as-nails Ramsey follows his orders faithfully, never questioning the chain of command as an act of loyalty to the country he loves. However, on this particular voyage, a shade of gray enters the picture in the form of his new XO, Lt. Commander Hunter (Denzel Washington). Educated at Harvard and more than willing to question his job and his orders, Hunter is every bit as loyal to the Navy as Ramsey is, but their conflicting personalities seem destined for a showdown. Working from a script by Michael Schiffer, Scott molds what could be a typical action story into a compelling look at the nature of war in the nuclear world. There are scenes of battling submarines and the ever-reliable moment when the Alabama's crew may very well sink to their deaths, but Crimson Tide is more of an actor's picture than anything else. When Ramsey receives the order to launch nuclear weapons, he has every authority and obligation to do so unless otherwise informed through proper channels. However, during a sub attack, a second transmission comes through only to be cut off. Now Hunter feels it his duty to stop the attack until the second message can be confirmed, resulting in the two officers pitting the crew in a war against each other, the Russians, and the clock. All human life may lay in the balance, which is exactly the kind of stakes that really exist in this kind of a situation. I don't know how accurate the movie is to the exact nature of nuclear launch protocol, but it seems to be realistic. What is so admirable about is how both Ramsey and Hunter are shown as real people, not clich�s designed to drive home a message. With razor-sharp dialogue and enthralling performances from the whole cast, the movie will likely stem debate amongst its viewers. Hackman plays Ramsey as an intelligent, studied man who by no means wants to launch nuclear weapons, but believes that, under these circumstances, he must carry through the orders in hand. Washington matches Hackman every step of the way, giving a strong and subtle turn as Hunter. Completely willing to do what his orders say, Hunter sees complexities that go beyond their mere reception. The two leads receive convincing support from George Dzundza, who plays the boat's chief, loyal to Navy regulations, and Matt Craven, who plays an officer unquestionably loyal to Ramsey. Set to the tune of one of Hans Zimmer's most memorable scores, the film moves along at a fast pace. Scott manages to pause at the right moments in order to give both the audience and characters some breathing room, which makes the human element ring true. The sound design is especially effective at bringing out tension, but the cinematography and production design go a long way in simulating the setting of a submarine. Unlike in his recent, over-produced work, Scott's direction here is relatively tame. The camera is more of an observer than anything else, letting the story's drama speak for itself. Keeping the story on a tight leash, Scott does well in creating a feeling of suspense. 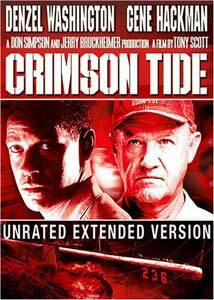 Made right before his filmmaking leaped over the edge in terms of taste, Crimson Tide shows Tony Scott at his best. This new extended cut features roughly six extra minutes that offer some brief insight into Dzundza's character. Frankly, if I hadn't watched the original version shortly before seeing this new cut, I doubt I'd have noticed the differences. Image Transfer Review: This new cut of the film may not be any better than the original version, but this image transfer is undeniably superior to the previous DVD release. Finally getting an anamorphic 2.35:1 picture, the image here is much richer in detail and color than the earlier release. I noticed some edge enhancement on character's faces, but it is fairly minor and not particularly distracting. Depth is quite strong throughout, with deeply textured blacks and quite striking colors. Audio Transfer Review: The Dolby Digital 5.1 mix is not especially different from the earlier DVD release. About the only difference I noticed is that this new mix is less bass-oriented than the previous incarnation. Personally, I see this as an improvement, but others may not. At any rate, dialogue is crisp, ambient noise nicely mixes into the rear channels, and there's a fitting amount of dynamic range. Extras Review: While there isn't a particularly impressive collection of supplemental materials on this disc, what is included makes for a nice bonus. There are three exceptionally brief deleted scenes. Movie Trivia on the Bus (00m:30s), Sara Interviews Radchenko (01m:31s), and Awaiting the Naval Hearing (01m:13s) are really just minor extensions of scenes already in the film. A somewhat comical featurette, All Access: On the Set of Crimson Tide (10m:18s), is hosted by George Dzundza and actually has a good amount of footage showing the cast and crew at work. There's maybe one too many gags shown here, but the rest of it is worthwhile. Finishing things up is The Making of Crimson Tide (19m:56s). This promo piece contains the usual collection of interviews and clips, but also has some nice bits about the Navy refusing to cooperate. The material in these two features is surface-level, since they cover a lot of ground in a short period of time. However, this is all a major improvement over the barebones predecessor. An intelligent, enjoyable thrill ride, Crimson Tide: Unrated Extended Edition doesn't improve upon the theatrical experience, but doesn't weaken the movie either. This DVD features a superior image transfer and some brief, but worthwhile, extras.